Onionland's first colony. Made to make Finns' butts hurt, as they don't deserve such a cosy island. Sadly, it was took back by dirty Finns. One day some poles from Onionland suggested starting a war with the Finngols. venomthrope reacted by paying the nation's capital a visit; though a representative of his nation, he behaved in disregard to any diplomatic conventions and only provoked the docile Poles. The settlers of Walefinów celebrating the founding. Unwilling to bear such an affront, Koinu decided to claim some land for Onionland near New Finngolia to secure the Poles a strategic bridgehead near enemy lines. He came from Izmorosjov to the shores of Finngolian land and planted a Polish flag on an unclaimed island. People started gathering. Nieuw Walschor is rumored to have had a hand in the affair, though a sign in the first house P_P_A built on the island denies any involvement of his. Representatives of the Peaceful Island Empire of Kijima and the Holy Banana Empire recognised the Polish claim to the island and graced it with a state visit each. Enton built an onion made of mushroom blocks - a trademark of Onionland - on the island. 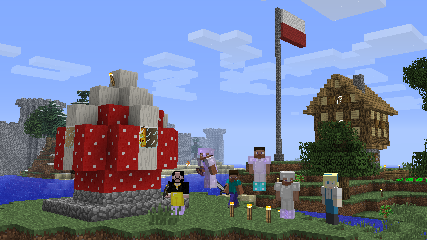 Soon over half a dozen Poles had assembled to celebrate the founding of their colony. Tasty Pope's Kremówkas and other noice things were prepared, and consumed amid rudimentary fireworks. On 28.02 well known finnish mod abuser removed stuff built on the island. Two brave Poles tried to fight but they got banned for 'illegal pvp' although Onionland was in state of war with New Finngolia. Poles just took materials that were left for them and left Walefinów without saying anything. Onionland was confirmed for being bunch of pussies. There was a cosy hut, a flag and an onion. Also Finngolian walls are visible from the island. Now there's nothing. The Polish natives to the island live in constant fear of the faraway imperialistic New Finngolian nation spreading its tentacles into the farthest parts of the ocean. Walefinów was home of guns and cannons. Various weapons were being built in order to secure this land from savage finns. The sprits of all brave hussars and plumbers. Now they're gone.